I’ve used Aperture since it’s first release. For many years I used a philosophy to organize the library based on date. My initial thought was to use a root folder hierarchy that would NEVER change. Therefore the Decade/Year seemed appropriate. However as my library swelled to almost 100,000 photos shot over 40 years; and as Aperture evolved as a program it became apparent that this wasn’t necessarily the best approach for me. I came to this realization after struggling to remember the approximate year a particular photo was shot in – and after a reassessment of the feature sets available in the latest version (I’m currently use Aperture 3.4.5). The simple truth is this. Aperture is a sortable database. I can click on PROJECTS and select a sort By Date…and in seconds it will build a virtual structure just like my old philosophy. I can select PLACES and it will build a virtual structure based off the location. There is no doubt that success for building a powerful library lay in SMART FOLDERS and KEYWORDS. But I found that searching for photos by the date I shot them, only worked if I knew that date to begin with (and for some pro’s workflow, this will still make sense). But if not, I was doing keyword searching. And even with good Keyword Management, this can still be a bit hit and miss. So with Aperture’s native searching and sorting abilities in mind…I set out to produce a more efficient infrastructure for my library. As I mentioned, nothing is as powerful as good key-wording. Keywords and Albums are the only conventions within Aperture that allow photos to be in more than one group and or level (for the most part). So you could have a shot of your Son & Daughter in front of the Christmas Tree, and Keywords allow that to be found by Smart Folders or Searches on any combinations of the three. Albums are powerful as well, but as the library grows, the manual process of putting every photo in a variety of non-smart albums is time consuming. Still, even without albums…key-wording can be equally time consuming. 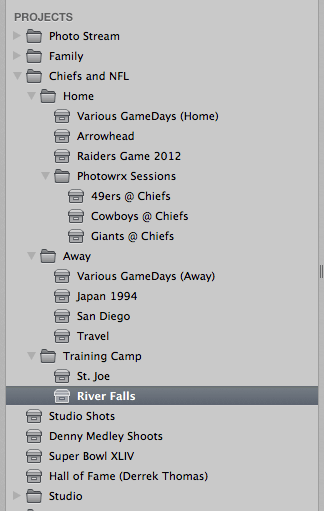 Before I explain what I mean, keep in mind the way Aperture Folders work. If I have a root folder with child folder or project underneath it, the photos from the child are inherited and visible through the parent folder. So, my root structure contains folders that correspond to the most basic common groupings I have. I’m then able to build a Smart Folder to select photos based on parent folders. For example: In the ALBUMS section of my library, I have a couple of Smart Folders that will select any 3 star or higher rated photos from parent folders. Because 2 & 3 are children of 1…#1 will also contain photos from 2 & 3. However, 2 and 3 are independent of one another and smaller more refined collections. All that needs to happen for a photo to appear in their respective Smart Folders is for the Project to be placed within the parent or child folders AND for the photo to be rated 3 stars or above. I should also mention here…that I do take the time to utilize both FACES & PLACES. So, a fourth Smart Folder might be “Best of Len Dawson.” A fifth, “Best of San Diego.” These would provide for any photos that match Len Dawson’s face and or were shot in San Diego. Still confused? Along with this concept is the shift in work-flow as well. Once photos have been cataloged, you won’t spend as much time in the PROJECTS section of your library – unless that is where you choose to keep your ALBUMS & SMART FOLDERS. I personally drag these into my ALBUMS section and then I can hide the PROJECTS section and work primarily from a huge collection of SMART FOLDERS. Fortunately, Aperture will also let you use this nesting trick with the ALBUMS section as well. You can have a collection of Smart Folders based off Faces and group them under PEOPLE folder. This is where the flexibility and power kicks in, because you can have the same photo categorized differently in multiple folders. Additionally, I have the Parent folder of Nested Smart Albums selected to sync to my iPhone and iPad. So, adding a Smart Album down the road will automatically sync without changes to the sync profiles inside iTunes. One of the difficulties in coming up with a set of root/child groupings, is that many photos can fit into multiple groups. Try NOT to make the groups so broad this occurs. Broad groups are better served by keywords. For example, root parent groups like Portrait or Candid could possibly apply to EVERY photo in your library. Likewise, root groups of FAMILY, BIRTHDAYS and CHRISTMAS will conflict. CHRISTMAS & BIRTHDAYS should be children of the FAMILY root. My advice would be to come up with a basic structure using some Root Folders. Then start sorting projects into those folders. The beauty of Aperture’s flexible structure is that you aren’t permanently tied to anything! And the process of trying to sort the photos will help you define what is needed for structure.